Have a very Merry Christmas and a Happy New Year! We will post again in 2016, until then, we will be in the office and available if you need us. Thanks for a great year and see you on the other side! Congratulations to our five recipients of the 2015 Founder’s Award! Every year, we recognize our employees from each office who routinely demonstrate a commitment to embracing and solving any challenge before them. Presented at our Alpha Christmas parties, this award was created to recognize those who give exceptional service to both clients and our Alpha family. This year’s recipients are Harsha Addula, PE and Junior Hernandez from our Dallas office, Bodie Yarbrough from our Fort Worth office, John Joseph from our Houston office, and Judy Villarreal from our San Antonio office. Congratulations with a heartfelt thank you for being examples to all of us at Alpha! 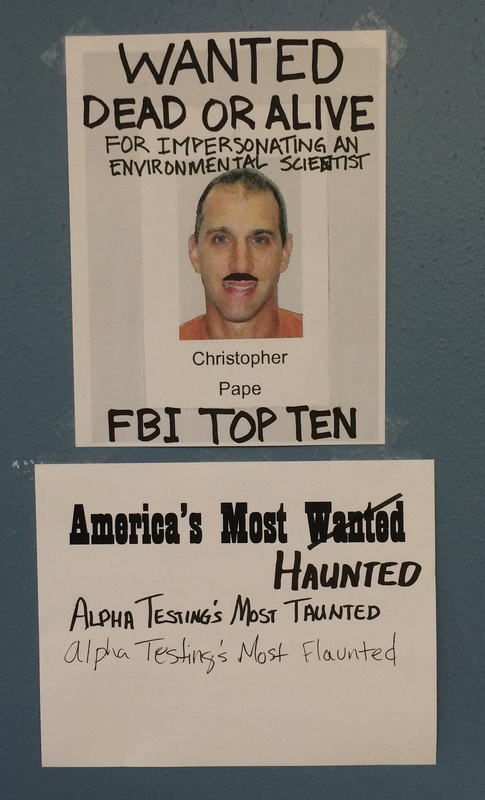 Christopher Pape’s wanted sign captures all the attention on the bulletin board at the ESA office – and it should! The person responsible is still laying low, but from the looks of it, I’d say it was a team effort. Our Alpha Geotechnical department suited up for a little indoor skydiving at iFLY in Frisco – Gasp! during the work week!! Lucky for them, the flight was before the big thanksgiving meal… a timely decision indeed. No jumping out of airplanes at this place, but the flight chamber creates the feeling of free falling, and if you close your eyes, it just might seem real. Is this group ready for formal jump school? See our iFLY project in Houston on our Facebook page. Which department will earn their wings next?